Q: Why are bulldogs so expensive? Q: Is there any way to get a cheap bulldog? Q: How can I differentiate a reputable breeder from a "backyard" breeder? Q: Can I buy a bulldog from a pet store? Q: Will a bulldog fit into a family with small children? Q: Do I have to keep my bulldog indoors at all times? Q: Do I have to have air conditioning for my bulldog? Q: Can bulldogs be trained to do tricks? 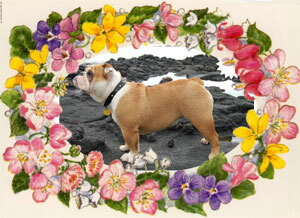 Q: What does the ideal/standard bulldog look like? Q: What health considerations should I worry about? Q: How do I learn about showing my bulldog? Q: What is the proper diet for a bulldog?